In a time where graphics and immersive storytelling in gaming is constantly achieving new heights, there is something refreshing about the Xbox 360’s arcade collection. For bibliophiles, it’s like the Harry Potter to the War and Peace. For cinephiles, it’s like the Die Hard to the Citizen Kane. For gastrophiles, it’s like a burger to a filet mignon. Whatever it is, it can be a nice change of pace, especially if it’s a puzzling platformer that knows how to find the right mix of classic gameplay, functional innovation, and solid humor. ‘Splode ‘cross the gap for the in-depth. Of all the big triple-A game franchises out there, none seem to polarize gamers as much as the Grand Theft Auto series does. 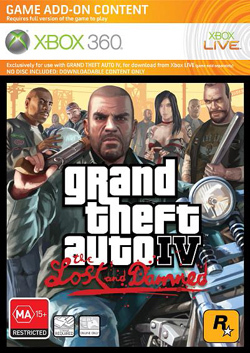 It has a huge following – Grand Theft Auto IV alone recently was reported to have shipped 13 million copies. That’s a whole lot of games, and the power of this brand can’t be denied. Sales aside, however, there seems to be two distinct camps when it comes to these games – GTA lovers and GTA haters. I’ll preface this review by stating that I am definitely in the former, but that I can certainly understand the latter and I hope that I can use this perspective to show in this review why the recent downloadable expansion, The Lost and Damned, is worth playing.